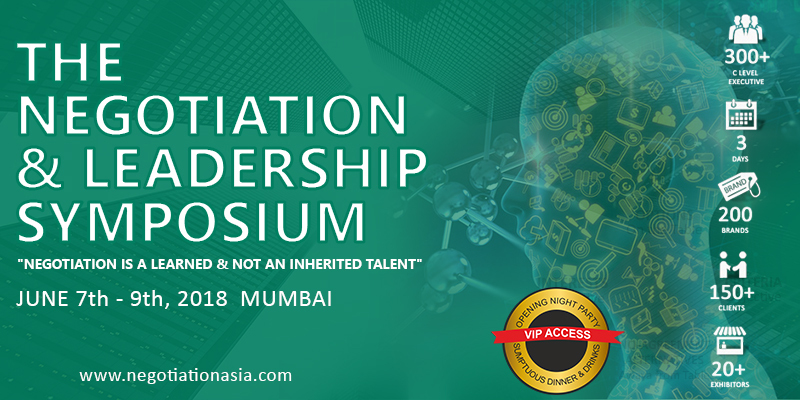 The 2018 Negotiation and Leadership Symposium is coming to Mumbai, It will be the largest gathering of thought-leaders on strategic negotiation in the world. Come to learn strategies from the most successful negotiators & leaders that will guarantee you 10X Growth in 2018. Negotiate and close large or complex sales. Handle the squeeze between consolidating suppliers and rising raw materials prices. Negotiate mergers and acquisitions. Handle business development and licensing negotiations. Purchase goods and services. Negotiate exploration and development deals. Negotiate joint ventures, alliances and other partnering arrangements. Negotiate with professional service firm clients on fees, scope, relationship improvement, problem management. Negotiate internally to implement projects. Develop a strategy for getting design approval for large infrastructure projects, construct the project in a relatively uninterrupted way, and operate it without roadblocks. Negotiate information technology contracts. The Symposium provides executives the opportunity to spend two day immersed in a productive environment with peers from large enterprises and multinationals, as well as business specialists and other experts. ALL of the TNLS expert speakers are highly vetted and hand selected by us personally. They are required to have an extensive background in both the education AND implementation of the strategies that they will present.